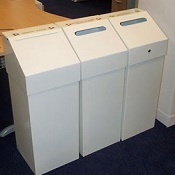 We specialise in bins and office recycling bins and offer a wide range to suit any office. 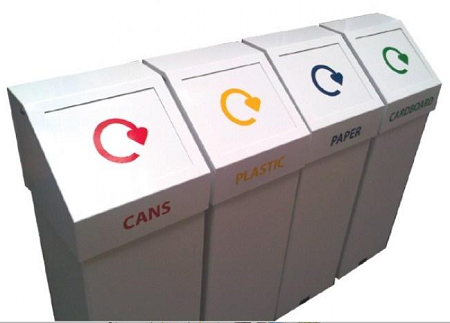 This range we are featuring as it can be finished in many colours and customised with marking materials in line with your recycling policy. Great flexibility and an atractive recycling option. Available in a confidential version as well with a lock. 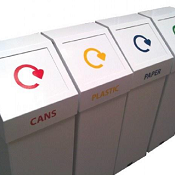 Self-closing, fire retardant, metal bins with colour coded flaps to segregate waste prior to disposal. Robust construction manufactured in Zintec steel and powder coated. Stock colour - white. 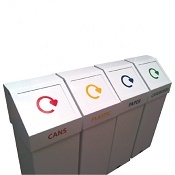 Large, lightly sprung flap, for ease of use.Flaps supplied with green, yellow or blue recycling logos. Other colours can be supplied on request. 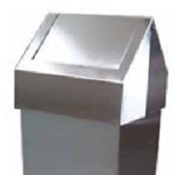 Available with optional easy lift out galvanised metal liner. Self - adhesive wording can be supplied Available in white, black,grey, ultra blue, dark blue, dark brown, dark green, light green, red, yellow, beige, brass effect, maroon, silver grey, titanium, antique silver, antique green.